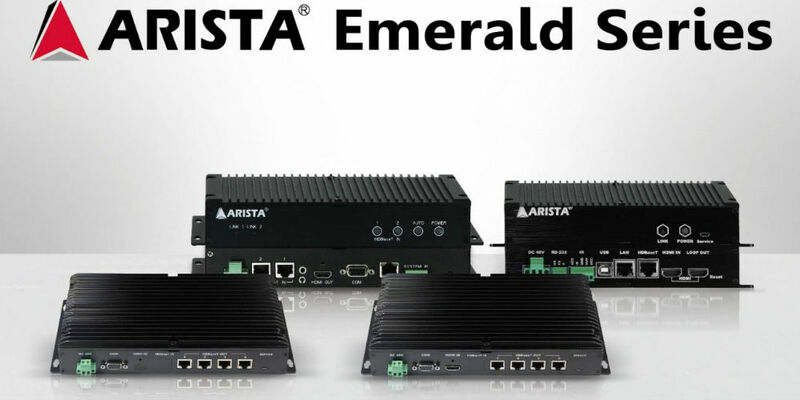 Arista Corporation recently introduced the Emerald Series HDBaseT 2.0 family of transmitter/receiver products. Consisting of four products, with each based on the HDBaseT 2.0 architecture and controllable via either Telnet or an RS-232 interface, each product has a built-in web server and can be controlled via a common web browser. A video source selection switch is available on some models and the remote video sources can be easily switched to HDMI output via RS-232 commands, Telnet, or web-based control. When video source auto selection is enabled, the video source will be selected and sent to the HDMI output when the video source comes alive. All models in the Arista Emerald Series have a built-in CEC command emulator. A “TV on” CEC command will be sent to the TV display via the HDMI cable when one of the video source channels receives a video signal. When auto-standby is enabled, a “TV off” CEC command will be sent to the TV set to turn the TV off in 30 seconds when no video signal is present. The TV can be turned on and off, and audio can be muted via RS-232 commands, Telnet, or web-based control. The TV will display a blue blank screen when the video mute is activated. Some of models in the Arista Emerald Series have a blank video function available. A blue blank screen will be displayed when a Blank Video command is activated. The blank video function is useful when the presenter wants to direct the audiences’ focal point to something else other than display screen. Web control provides RS-232 control routing to either one of the remote HDBaseT transmitter/receiver’s RS-232. That means that an RS-232 command can be issued locally or from either one of the remote HDBaseT transmitter/receiver’s RS-232 port. Additionally, the firmware can be updated via the RS-232 interface locally or via RS-232 on the transmitter/receiver unit. Each model in the Arista Emerald Series product family has a built-in IR emulator. The IR emulator is capable of learning IR codes from the IR remote control and is capable of sending IR commands via the IR emitter when the TV remote control functions cannot be achieved via CEC commands. The Web control also provides IR routing: the IR signal can be routed from either one of the transmitter/receiver’s IR port for an alternative TV control tool. The USB connection on each model can be routed to either one of the Transmitter’s USB ports if remote USB accessibility is required. Each model in the Arista Emerald Series has PoE capability to power a remote transmitter or receiver. Further, the Splitter model in the family can turn off each PoE output individually to power off the remote receiver. Each model in the Emerald family has a power saving circuit that can be controlled remotely. It will go into sleep mode when the main power circuit is turned off. The main power circuit can be turned on and off remotely via web control or RS-232. This conserves 80 percent of the power when it goes into sleep mode. “Our new Emerald Series products bring a wealth of functionality to the contemporary meeting or presentation space,” said Arista Corporation president Paul Shu in the company announcement. The Arista Emerald Series product line varies in pricing depending upon the desired unit and its configuration. Arista Emerald Series HDBaseT 2.0 product family will be on display in booth #1161 during InfoComm 2019 in Orlando in June.